Off to Whiskey Cove again for some crabbing again! Actually, we ended up not doing any crabbing at all, and it turned into a fun dive day with skills. Originally it was going to be Heather, Wendy, me and Josh, but Dave and Vlad also came along. It was a very wet day and it was back to regular BC diving weather from the hot summer! 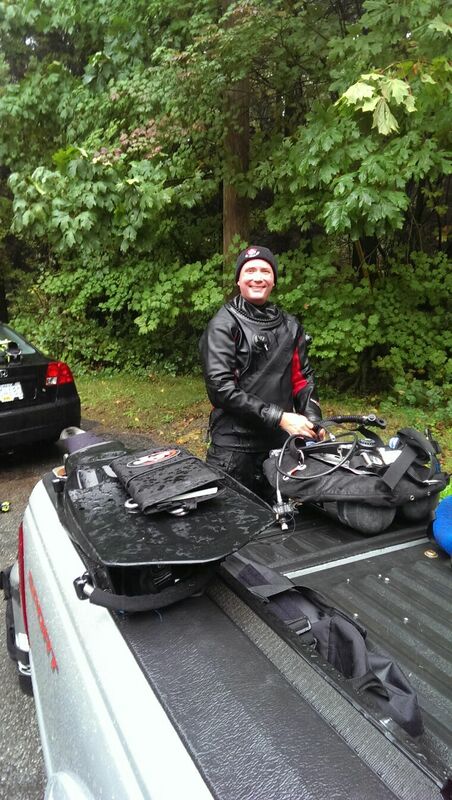 With so much rain, we stopped at the Belcarra picnic area and got into our suits there. Heather got this picture of Wendy on dive two, to show you just how wet it was. And here was me gearing up. Heather and Wendy formed one team, and I went with Dave, Vlad and Josh. Josh wanted to do some stage bottle practice, and Dave was trying out a new light. On our first dive, we checked out the rocks to the right. Visibility was alright, but not great. There were quite a few schooling perch as well as rockfish. I could have sworn that I saw some black rockfish, but they were probably just juvenile copper rockfish with a darker colouring. The dungeness crabs looked bigger this time around (they were very small last time). I was hoping for more nudibranchs, but I only saw one yellow margin dorid. We also came across some of the rock overhangs that the 151 Dives book talked about. They were not caves in any way, but some of them were a few feet deep. The one we found was about 20 minutes into the dive. On the way back, we passed Heather and Wendy doing their first dive, then Josh and I did some stage bottle practice. Dave had to go home, but Vlad, Josh and I did another dive doing skills and it went well. Whiskey Cove was quite good for that. There were many concrete blogs and chains from the floating docks above, giving a lot of good reference points. You did have to watch where you surfaced though. I got some video, too. The giant moon jellies were very cool! We also found some treasure, some lost dive weights. Vlad got to try out a PVC tube that he had put together that could be used to hold stuff like that, or used to clean up line or other garbage from the bottom. It worked pretty well, and was better than trying to carry things in your pockets.